Posted in: revolution. Tagged: franklin, large, original, poster, rare, revolution. 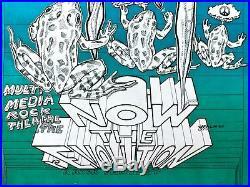 NOW THE REVOLUTION – 1969 by JIM FRANKLIN ORIGINAL LARGE RARE POSTER. THIS IS A RARE EARLY FRANKLIN. 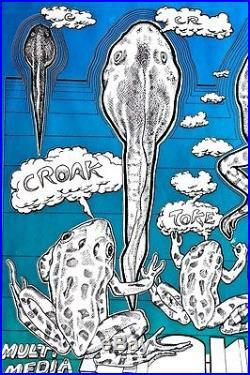 TADPOLES TO CARNIVORE STONED FROGS – A REVOLUTION. 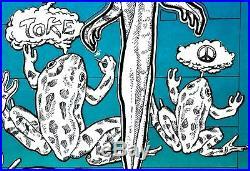 ARTIST: Jim Franklin is a seminal Austin artist from the 60s and on. He popularized the armadillo as the hip counter-culture alternative to the Texas Longhorn. Armadillos became the iconic symbol for those not enamored with the Texas political establishment. Besides an astonishing array of music and event posters, JFKLN has many gallery shows and is collected as a fine artist. He works away at his studio in Austin. SIZE – LARGE 22 1/2″ X 28″. CONDITION: VERY GOOD FOR AGE. PHOTOS ACCURATE BU7T NO BIG BROWN SPOTS AT BOTTOM. Original – like everything we sell. Delivered with certificate of Authenticity. Beware of disreputable sellers listing items in the headline as Vintage then in the fine print squeezing in the word reproduction. If the bargain seems to good to be true – it usually is. At Jeff’s World Store we take pride in offering a wide selection of authentic and rare posters. Folk art and coins. All item authenticity is guaranteed. We take back what we sell, without question, up to 14 days. We value the input and questions from our customers, and knowledgeable collectors. Your input is valued. We are honest but sometimes make human mistakes. If your comments help us improved our listings we appreciate it greatly. We are not really a store. As I get older, it seems time to sell some of my collection and simplify my life… INVESTING: We list many quality and rare items that are collectable. Desirable posters can be a great investment. I emphasize artists because the posters, that have skyrocketed in value over the last century, have been by first rate artists depicting special moments in our history. Sometimes I will add an editors note if I think the info might be helpful to collector/investors. TERMS: We try to use these categories for condition. EXCELLENT = about as good as one can get on posters of its age. VERY GOOD = maybe a wrinkle or crease or two. Any toning appears in small areas of the border not on the image. GOOD = A poster that may have small problems like creases, toning, tack holes in corners, small damage to the edges. We try to give accurate photos. Vintage = a poster that was put up on a bulletin board and was used in its day. Also these terms: RARE. Hard to find on search engines and rarely seen by serious collectors. SCARCE Some are out there but hard to find. ONE OF A KIND. = Just what it says. 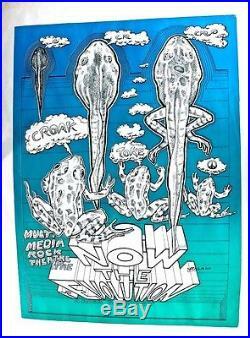 The item “NOW THE REVOLUTION 1969 by JIM FRANKLIN ORIGINAL LARGE RARE POSTER” is in sale since Friday, August 04, 2017. This item is in the category “Collectibles\Comics\Silver Age (1956-69)\Alternative & Underground”. The seller is “nightbyrd” and is located in Austin, Texas. This item can be shipped worldwide.